If you have kids, then you are well aware of the need to keep up with the latest and greatest of everything, including technology. One of the hottest gadgets in the market is the ereader. It was probably the most asked-for items on gift lists in recent holidays. And, as a parent, we want to indulge our kids, especially when it’s an item that will benefit them. All parents want their children to excel in school and to have some constructive hobbies, rather than sit in front of the TV all the time, or play video games. I’m not saying there is anything wrong with those activities, but in moderation, right? Due to the vast amount of technology and how kids are younger and younger when learning it, it only makes sense that reading a book might have to go down the path of technology as well. And, we certainly want to encourage reading, as it’s a direct link to learning. So, welcome to the world of ereaders. There are several benefits to using an ereader, no matter what your child’s age. First, for children in school, it is not nearly as heavy to carry back and forth to school in their backpack, as traditional books. The reason is because you can store multiple books in one small device. Also, it’s cost-effective, as eBooks are typically less expensive than a hard copy book. You can even rent e-textbooks, and not have to visit the library all the time. Actually, visiting the library isn’t a bad thing. However, remembering to bring the books back on time is another ‘chapter’. You can also add the ‘coolness’ factor of reading from new technology, and which could lead to reading more for your child. The more they read, the more they learn. One last benefit I wanted to mention is that it’s great for long road trips to help keep the kids entertained. You probably won’t hear the dreaded ‘Are we there yet?’ as often. Which One is Right for Your Child? Good question. There are many to choose from, and you want to make sure that you get one that the kids will actually use. I had to take a few things into consideration myself when I bought one for my daughter. So, I have compiled a list of things to consider when shopping for your first one, or your next. First, there are ereaders, with the sole purpose of reading. These have been around for a few years already. But, there are also tablets, such as Kindle Fire and the iPad, which have multiple functions in addition to the ability to read eBooks. There are ereaders for all ages. For the young children who are just learning to look through books and read, there is the interactive reader which is ideal to keep a young child’s attention. But, for children who are 8+ years old, an adult version would be a better option. The ereader has evolved into more functions than basic reading. Amazon first introduced us to the Kindle back in 2007, which was great for the purpose of reading. However, times are always changing. Now, you have options on various ereaders and tablets, such as the ability to watch movies, play games, and surf the Internet. If the only purpose is to read, there isn’t any reason to pay extra for all the bells and whistles. However, an all-in-one device might be beneficial for those who love to do it all. A few top-selling ereaders are Amazon Kindle, Kindle Touch, Nook Simple Touch and Sony PRS-T1 Reader, just to name a few. Kids will appreciate color for graphics rather than a gray-scale display, to hold their attention longer. This is even more important for viewing content when using for more than just reading. However, most of the major brands all offer color display such as Kindle Fire, Nook Color, Nook Tablet and iPad. Fortunately, even our older children (Generation Y) grew up learning how to navigate through a computer, as well as other technology devices. So, navigation is not an issue for them. 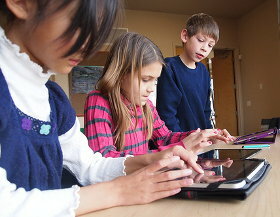 But, even for the younger kids, most options are user friendly. When it comes to display, ereaders use E Ink Pearl technology, while tablets use backlit In-Plane Switching (IPS) LCD. E Ink displays text like paper unlike a computer screen. It’s easier on the eyes. This is significant if your child plans on reading for long periods of time. On the contrast, backlit IPS LCD is great for graphic display and has a wider viewing angle for consuming multi-media content such as movies and videos. The last area to consider with display is the size. If the screen is larger, it’s obviously easier to read and will be less strain on the eyes. Of course, the larger the screen, the heavier the unit will be. However, all things considered, they are still relatively light in weight (up to 1.5 pounds) compared to a traditional laptop. The design isn’t necessarily that critical, as most are relatively similar in style. However, the quality is something you want to definitely consider. The best advice I can give you would be to do some research online by searching reviews. You can easily do this by typing in ‘ereader reviews’, or ‘tablet comparisons’ into your search engine. And it’s always great to get recommendations from friends and family. This once was a trickier area than it is now, due to having to stick with certain content for particular brands. For example, if you prefer to purchase your content from Amazon, then a Kindle would be your best bet. Or, for purchases solely from Barnes and Noble, the Nook should be considered. However, there are apps now available that allows to cross-use content for various ereaders/tablets. With these apps, you could freely purchase from various places, regardless of what brand ereader or tablet you choose. One area that I want to emphasize on is e-textbooks. If you are planning on using your ereader or tablet for e-textbooks, then you might want to check out Amazon for material. In my opinion, they are far above the competition when it comes to e-textbooks. They have a vast selection that you can purchase, as well as rent, if you are looking to save money. And, who isn’t? What are the next five factors to consider? Read Part 2 of the eReader Buying Guide. Lei Chidester is passionate about Internet Marketing. In her spare time, Lei is an avid reader and Publisher of http://ereaderguide.org where she shares tips and in-depth reviews of best ereaders for the kids. 10 Things You Need to Know When Buying an eReader for Your Kid [pt.1] was posted in Learning, Parents and Teachers by Guest Author.